Amazon Wish List - Can You Help? Our Amazon Wish List is a really easy way to help and donate to Wild Place Project. It is made up of exciting and fun enrichment objects available to purchase for the animals here at Wild Place Project. One of the most unusual items is a scent spray for the cheetahs! All you need to do is click here, browse through the items and add something to your basket just like your normal shopping. The lovely people at Amazon will then deliver it straight to Wild Place Project. 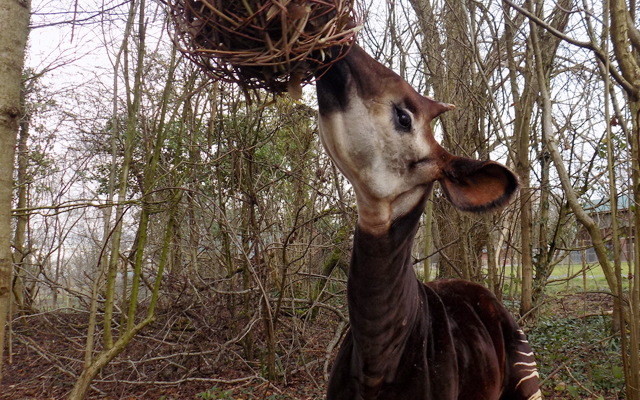 Environmental enrichment is important for enhancing the well-being of our animals. Enrichment can be physical (e.g. puzzle toys, complex climbing structures), sensory (e.g. naturalistic scents or sounds), or food-based (e.g. concealing food in novel ways). Here at Wild Place Project we have a team that dedicates time to planning and creating the most relevant and effective enrichment for our animals. Our in-house animal enrichment team, made up of researchers, keepers and other team members have spent time studying, designing and evaluating the most relevant and effective enrichment for all animal groups based on their specific needs. The buffet ball will help enrich our parrots who are behind-the-scenes, while the itch post is a favourite for our zebra, as it keeps them entertained and helps them rub those hard to reach areas. Make sure you leave a personalised gift message with your name and contact details when given the chance to 'Add gift options'. Without this information we are sadly unable to thank our donors. If you would prefer to remain anonymous, we would like to thank you in advance for your generosity, and hope you might get the chance to see your donation enriching the lives of our animals at Wild Place Project.